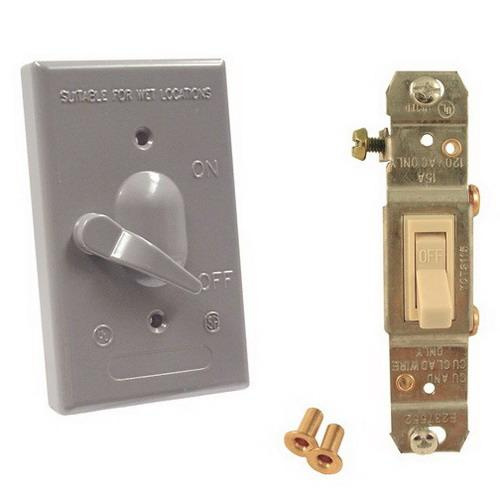 Raco TradeSelect® Bell® Lever operator 1-Gang switch cover in gray color, is suitable for using with weather-proof device box. Rectangular cover in powder-coated finish, features die-cast metal construction. It comes in 1-Pole 125-Volt, 10-Amp switch configuration. This vertical-device mountable cover measures 2-53/64-Inch x 39/64-Inch x 4-39/64-Inch. It is ideal for infloor delivery systems. Cover is UL listed, CSA certified, NEC 2014 compliant and meets NEMA 3R compliant.